Aside from the usual who is playing, for United on Saturday there was the added knowledge of who wasn’t. LVG in his wisdom had decided to tell everyone that David De Gea was not in the right place to be starting for Manchester United. I respect his honesty, you want your ‘keeper on form and not distracted because he is picking out curtains for his new apartment in Madrid. The manager turned to Sergio Romero, and he was up to the task – two quick crucial saves did indeed save the points. It was a good start for him, as it was for Luke Shaw, he has a season under his belt and will look to push on this campaign. Chris Smalling showed confidence in his dealings with Tottenham’s perceived danger. I feel obligated to point these things out, because people might spend the time between now and (Friday!) the Villa game moaning about how there a lack of spark, same old same old, a one goal victory achieved with not one shot on target. 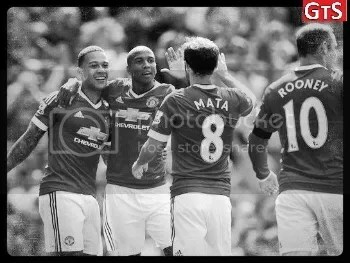 Memphis, Darmian, Romero, all showed us we have reasons to be cheerful. We have a defence that is yet to concede and we know all too well from last season (and Arsenal in the opening weekend) that it could have gone very wrong. ANOTHER reason to be cheerful, I know, we are spoiling you… Wayne Rooney was not wearing that vest type thing under his shirt; this brought to an end the great short sleeve long sleeve debate. Long sleeves under a short sleeve shirt? Winds me up more than half and half scarves. I found these words of wisdom from Juan, from his blog. It sums it up rather well. Rather generous with the use of the word “we”, we didn’t manage to score. Cheers, Kyle.